After a successful six months, Oxford’s joint taskforce to disrupt and tackle open drug dealing and drug taking in the city’s public spaces is set to move part of its work to a new area of the city. Oxford City Council has launched an online lottery to help raise funds for local voluntary and community groups in Oxford. The theme for this year's International Women's Day, which takes place on 8 March 2019, is "Better the balance, better the world". The City Council and its partner, Oxford Direct Services, maintain parks across the city. They provide oases of green tranquility and a refuge from the busy hustle bustle of city life. Oxford City Council has secured a closure order against a property in Friars Wharf to protect a vulnerable resident from County Lines drug dealers. Low Carbon Oxford North, Oxford Direct Services and Oxford City Council are supporting National Tree Week by planting trees at Cutteslowe Community Woodland on 24 November from 10.30am to 12 noon. As part of its funding agreement with the government’s Rough Sleeper Initiative (RSI), Oxford City Council is conducting overnight street counts of rough sleepers every two months. Agreement has been reached in principle with the Bullingdon Community Association (BCA) for the demolition of the defective Bullingdon Community Centre building and its replacement with a brand new purpose-built facility, using off-site modular construction methods. At the request of St Giles’ Church, Oxford City Council, assisted by Thames Valley Police, has removed seven tents and more than 100 needles from the city centre churchyard. 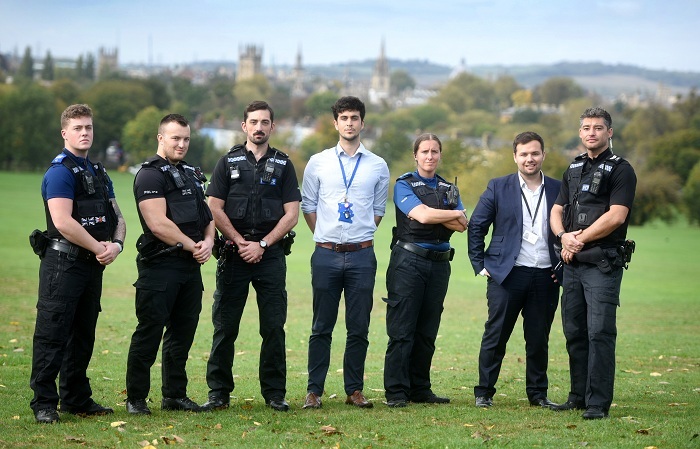 Oxford City Council, Thames Valley Police and Oxfordshire County Council have launched a joint taskforce to tackle open drug dealing and drug taking in Oxford’s public spaces. October is International Walk to School Month, and as new Government data shows that nationally 44 per cent of pupils walk to school in 2017, down on the 46 per cent recorded in 2016, Oxford City Council is calling on more parents to ditch the car and walk their children to school. Oxford City Council has outlined how it will use its services and resources to support young people growing up in Oxford over the next five years to be healthy, happy and engaged citizens. More than 30 musicians from over 20 countries have come together in Oxford to celebrate cultural exchange through workshops and creative collaborations. Oxford City Council is working with 12 local community groups to deliver a wide range of summer holiday activities for young people. Parents, key professionals, & community members are coming together to create a network for community-led children centres, with the aim of reducing the social mobility gap for under fives in Oxford. We have been working with Network Rail and its contractors to make sure that the forthcoming railway improvement works between Oxford Station and Wolvercote cause as little noise as possible. The Leys Festival and Horticultural Show is going to be a summer sensation! The Leys Festival and Horticultural Show will return to the Blackbird Leys Park on Saturday 7 July from 11am to 3pm. Cowley Road pulsated to the sound of music, dancers and street performers yesterday as thousands descended on the area to celebrate the annual Carnival. As part of Mental Health Awareness Week’s focus on stress, Oxford City Council is highlighting the activities, resources and support available to tackle stress and improve mental health and wellbeing. Oxford City Council will bring together the city’s green space providers and healthcare professionals to discuss how the natural environment can help keep people healthy. About 12,000 people attended May Morning earlier today. Oxford has been named the most vibrant community in England as part of a new report measuring the economy success of regions across the country. Oxford City Council is to extend the Oxfordshire Local Enterprise Partnership’s (OxLEP) Community Grants Programme, to further support disadvantaged groups across Oxford and Oxfordshire. Oxford City Council and event partners will implement a new crowd management system at this year’s May Morning. Oxford City Council and Thames Valley Police are set to launch a joint taskforce to tackle hotspots of the dealing and use of drugs in Oxford. Oxford City Council is set to start work on creating a new £1m health and community hub at Barton Neighbourhood Centre. Oxford United, Fusion Lifestyle and Oxford City Council have reached an agreement for Oxford Sports Park to become the new home of Oxford United’s training facility. Oxford City Council has taken a pioneering step and become the first local authority outside London to sign a declaration to help people reduce their sugar intake. To mark National No Smoking Day and to support residents wishing to quit smoking, Oxford City Council highlights plenty of ways to increase the chances of successfully quitting. Today is International Women's Day and to mark it Oxford City Council wants to highlight the work it does to combat violence against women. Oxford City Council will today start a consultation on a new strategy to support children and young people in Oxford. Oxford City Council has completed work on a £170,000 refurbishment of South Oxford Community Centre. As a Fairtrade city, Oxford will celebrate Fairtrade Fortnight, which runs from Monday 26 February to Sunday 11 March. Oxford City Council has agreed another £1.4m of funding to help organisations that support some of the city’s most disadvantaged communities. Oxford City Council has given grants totalling £4,500 in the last year to tackle Female Genital Mutilation (FGM) in Oxford. Foliage at a known drug dealing hotspot near the city centre has been cleared as part of a campaign to tackle drug offences in Oxford. Rose Hill Community Centre will be celebrating its second anniversary on Tuesday 30 January 2018. Four new exercise classes will be added to Rose Hill Community Centre’s (RHCC) activities this week. The Oxfordshire Local Enterprise Partnership (OxLEP) has announced six new grant awards to local charities and social enterprises as part of its European Social Fund (ESF) Community Grants programme. As we approach the Christmas season there is often an increase in the number of cons and scams reported to the Council. Young people in Oxford are being encouraged to give their time and take leadership roles at local charities. From music festivals and carnivals to half marathons and fireworks, Oxford plays host to hundreds of exciting events each year. Oxford City Council has developed new plans to redevelop East Oxford Community Centre – increasing the investment in the scheme by 60% and the amount of floor space for community groups by a fifth. Oxford City Council is backing a Thames Valley Police campaign to raise awareness and reporting of hidden abuses. Beginner computer (ICT) lessons for the community kicked off last week (21 September) at Rose Hill Community Centre. Already 11 students have enrolled on the course, some of whom are also taking English for beginners’ classes (ESOL) at the centre. Get Online Week will see thousands of events in communities across the UK help some of the 15.2 million people in the UK who are not making full use of the internet. Oxford City Council is set to install new street art in Cowley – and wants residents’ views on what the artwork should feature. Oxford City Council is set to create Oxford’s first publicly-accessible floodlit tennis courts in Florence Park. Bi-Visibility Day will be marked in Oxford on Saturday 23 September with a special flag flown over the Town Hall. Work has started on a £4.9m new sports park near Horspath that will feature new football, cricket and softball pitches, practice areas, a pavilion and changing rooms. Oxford City Council is delighted to support the Race for Life 5k obstacle event – Pretty Muddy – taking place at South Park on Saturday 16 September with staggered starts from 10 am. Oxford City Council has installed commemorative benches to celebrate the lives and work of Northway and Marston residents as part of a flood alleviation scheme. Oxford’s GO TRI Duathlon will return to the city next month. Oxford City Council will host Oxford’s first ever Nordic Walking Festival later this month. An Oxford City Council team has become one of just four organisations in Oxford to have received a prestigious accreditation for the way it looks after volunteers. The Rose Hill, Iffley and Littlemore Neighbourhood Policing Team has moved from their current office in The Oval into the dedicated police office in Rose Hill Community Centre. Oxford City Council is delighted to support the Foodies Festival, taking place at South Park between Friday 1 and Sunday 3 September. Oxford City Council is set to start work on a £170,000 refurbishment of South Oxford Community Centre. Oxford City Council is delighted to support the Oxford Half Marathon, back on Sunday 8 October as the Virgin Sport Oxford Half Marathon. Oxford City Council has become the first council in Oxfordshire, and one of only eleven Local Authorities in England, to receive the National Practitioner Support Service ‘Gold standard’ award in recognition of its efforts to prevent and tackle homelessness in the city. The winner of the Smart Oxford Playable City Commission is award-winning Guerilla Dance Project, who will encourage people to activate beams of light to map star constellations onto Oxford's streets. Unequal access to nutritious food is proven to have a direct bearing on a person’s health and general well-being. The City Council has joined leaders from cities across England to criticise Michael Gove’s Clear Air Plan, saying it does not go far enough to deal with the public health crisis caused by dirty air. This is a fire safety issue. Are you looking for ways to keep your 11-19 year old happy and active over the holidays? Oxford City Council’s Youth Ambition is running a range of FREE, fun and engaging holiday programmes for you. An initiative has been launched to tackle street drinking, begging, and public drug supply and use in Oxford city centre, and to safeguard those involved at risk of criminal exploitation. Runners have been invited to take part in the inaugural marathon in Oxford’s twinned city of Perm, Russia. Oxford City Council plans to install £500,000 of electric vehicle charging points for taxis and to phase out older, high-emitting hackney cabs from the city in another effort to reduce air pollution. Seventeen young footballers have almost hit their fundraising target to take part in the trip of a lifetime – two weeks at an international youth football camp in Russia. Oxford City Council is joining forces with Thames Valley Police to hold a Have Your Say stall at The Leys Festival and Horticultural Show. The Leys Festival and Horticultural Show is back! The Leys Festival and Horticultural Show will return to Blackbird Leys on Saturday 8 July. Oxford City Council has been granted a two-year injunction against an Oxford resident following anti-social behaviour. Oxford City Council has regained possession of a Council-owned property from a tenant following incidents of anti-social behaviour. Oxford City Council is marking Drowning Prevention Week by reiterating its warning about the dangers of swimming in the city’s waterways. Last night, Oxford City Council agreed to set up an Oxford Lottery to raise money for voluntary and community sector groups in the city. A global competition to create a more connected and collaborative Oxford has been launched today. Oxford City Council will be sharing messages of advice and support to help people improve their mental wellbeing and #ThriveInOxford during Mental Health Awareness Week. Oxford City Council is set to create a new green space in Summertown’s Alexandra Park. About 27,000 people turned out to see in May Morning today - the largest crowd ever. Oxford City Council is launching a new scheme to encourage young people to get involved in Oxford’s international links activities. The Lord Mayor of Oxford, Councillor Mohammed Altaf-Khan, is inviting nominations for the annual Certificate of Honour Awards which celebrates the invaluable work of Oxford’s voluntary community. A colourful community mosaic celebrating the rural roots of Wood Farm was unveiled on Atkyns Road yesterday. Oxford City Council has awarded a £40,000 grant to Aspire, ensuring that its community transport service for 149 elderly passengers in Oxford will be maintained. Oxford City Council has given a £10,000 grant to the Oxford Playhouse to improve literacy, develop storytelling, encourage imagination and introduce young people to theatre. Oxford City Council is launching new fitness activities in Blackbird Leys to enable families to have fun and get active this spring and summer. A single act of commemoration to mark the centenary of World War One will be led by the Lord Mayor of Oxford, Cllr Altaf-Khan and the Lord Lieutenant of Oxfordshire next week. Oxford City Council has announced that it is scrapping burial fees for children. The council will no longer charge bereaved parents in Oxford for a grave for children who tragically pass away before their twelfth birthday. Oxford City Council’s in-house youth team has helped more than 6,916 young people over the last four years by giving out £190,000 worth of grants every year. Community and voluntary organisations in Oxford will be able to meet funders and receive funding advice at the City Funding Fair. Oxford City Council has agreed £500,000 of funding to renovate the Bullingdon Community Centre in the Lye Valley. Oxford City Council has started work on a £33,000 revamp of play equipment at Margaret Road Recreation Ground in Headington. Oxford City Council’s in-house youth team has helped more than 25,000 young people over the last four years. Oxford City Council is delighted to announce the winners of the logo competition to mark the 70th anniversary of the twinning link between Oxford and Bonn. If you’re planning that special Valentine’s date Oxford City Council wants to remind you to look before you book. Oxford City Council’s Sport & Physical Activity team has achieved an ‘excellent’ rating from Sport England’s national assessment scheme, Quest. Oxford City Council has opened a £60,000 grant pot to help voluntary and community groups provide targeted work to help young people in Oxford. Oxford City Council has opened its £130,000 grant pot to help provide holiday activities for young people in Oxford. Motorists misusing Blue Badges in Oxfordshire are being targeted in a crackdown. An Oxford-wide campaign to encourage more people to become volunteers has resulted in 105 people signing up to give their time. More than 55,000 Oxford residents are volunteers and give up their time to help transform the lives of others – contributing about £27.6m to the city every year. Oxford City Council would like to publicly thank users and local residents for taking part in the recent East Oxford Community Centre consultation. Oxford City Council will fly the Transgender Pride Flag to mark Transgender Day of Remembrance on Sunday 20 November. PWC’s annual index of economic well being in UK cities, “Good Growth for Cities 2016” has placed Oxford at number one. East Oxford residents have until Friday (28/10) to have their say on a potential multi-million pound redevelopment of East Oxford Community Centre. Whilst the result of last June’s referendum on European Union membership will have repercussions across the UK, it is likely to have a particularly profound effect on Oxford, an international city that benefits hugely from people from other European countries coming to work here. Oxford City Council has won £140,000 from Arts Council England to continue the hugely-popular dance festival Dancin’ Oxford for a further three years. Oxford City Council has been awarded the contract by the Skills Funding Agency (SFA) to deliver the Oxfordshire Local Enterprise Partnership’s (OxLEP) Community Grants Programme. Young people in Oxford were able to take part in sport, art, science and youth clubs during the summer holidays thanks to £130,000 of grants from Oxford City Council. Refugees and asylum seekers who live in the City will be given free English language classes later this month, thanks to a £10,000 grant from Oxford City Council. Oxford’s allotment holders have been recognised for their achievements at a prestigious award ceremony. Residents will be able to view and have their say on a potential multi-million pound redevelopment of East Oxford Community Centre at exhibitions later this week. Celebrate Older People’s Day at the Old is the New Young Festival on Friday 30 September 2016, 10am to 4pm at Oxford Town Hall. Oxford City Council has reopened the Lower Pavilion in Cutteslowe Park after a £809,000 refurbishment aimed at encouraging more young people and women to take part in football. Oxford’s community and voluntary groups are invited to apply for grants of up to £10,000 to run projects, events and activities next year. The City Council has launched a new project to contribute to the improvement of health and wellbeing in the Barton area, courtesy of grant funding from NHS England. A feasibility study commissioned by the City Council has produced proposals for a £2 million redevelopment of the East Oxford Community Centre (EOCC) site in Cowley Road. Oxford City Council has given £6,155 of small grants to community groups and charities to help run events and projects across the city. The school holidays are nearly here, so it’s a good time to feast your eyes on the great activities taking place in Oxford to keep young people active this summer. Leys Pools and Leisure Centre will be inviting families to enjoy a free open day on Saturday (9/7). People of all ages are gearing up for the Leys Festival and Horticultural Show, which will take place in Blackbird Leys Park between 12pm and 4pm on Saturday 2 July. Refugee Week is a UK-wide programme of arts, cultural and educational events and activities that celebrates the contribution that refugees and asylum seekers make to the UK. Residents are invited to neighbourhood walkabouts in Cowley, Cowley Marsh and Lye Valley in June and July to highlight spots for cleanup and improvement. Oxford City Council, the University of Oxford and Oxford Brookes University have partnered with British Heart Foundation shops to encourage students to donate their unwanted items as they move out. Oxford United fans will be able to cheer on their newly-promoted heroes when the team takes part in an open top bus promotion parade through Oxford city centre tomorrow (10/5). Directors of the Ashmolean Museum and the Perm State Art Gallery in Russia met in Oxford last week to explore ways that the two organisations can work together in the future. All experienced or novice gardeners are being sought to enter Oxford in Bloom 2016. Oxford residents can take part in May’s National Walking Month with free health walks. About 25,000 people turned out to see in May Morning today (1/5) - the biggest crowd ever. An Oxford City Council campaign to encourage dog owners in Blackbird Leys and Greater Leys to clean up after their pets has seen dog fouling incidents drop 51 per cent. The Lord Mayor of Oxford Councillor Rae Humberstone is inviting nominations for the Annual Certificate of Honour Awards. National celebrations will be taking place across Britain on the weekend of Saturday 11 – Sunday 12 June to celebrate the Queen’s official 90th birthday. Oxford residents affected by living in cold or damp homes are able to receive grants of up to £2,500 to help keep their homes warmer. From music festivals and carnivals to half marathons and fireworks, Oxford will have something for everyone in 2016. The first competition at Horspath Athletics and Sports Ground following a £180,000 refurbishment will take place in April. Oxford City Council will host a forum to discuss football in the city tomorrow (24 February). Oxford City Council and WREN are set to invest £200,000 to make further improvements to Cutteslowe and Sunnymead Park. Oxford and León in Nicaragua will celebrate 30 years of twinning with a series of events throughout 2016. Oxford City Council this week launches a campaign to encourage Blackbird Leys’ dog owners to clean up after their pets. Oxford City Council’s campaign to find the most romantic spot in Oxford has found a winner: the gates to Christ Church Meadow in St Aldate’s. Oxford City Council has agreed £1.4m of funding to help organisations that support some of the city’s most disadvantaged communities. Oxford City Council is spending £4,000 to transform a meeting room in Blackbird Leys Community Centre. More than 100 people have signed up to the gym at the new Rose Hill Community Centre – a week after the £4.76m building opened. Oxford City Council has completed the refurbishment of public toilets in South Parade. Oxford is the fittest city in the UK and the number of people taking part in regular exercise is on the increase, two separate studies have found. Oxford City Council’s city centre Public Spaces Protection Order (PSPO) came into effect on Monday, 1 February. Rose Hill residents will get to experience what the much-anticipated Rose Hill Community Centre has to offer during the official opening on Saturday (30/1). Residents of east Oxford are invited to attend the next East Area Forum on Monday 25 January from 6.30pm to 8.30pm at East Oxford Primary School, Union Street. As part of the national refugee resettlement programme, the first Syrian families have arrived and are settling into life in Oxfordshire. Would you or your organisation like to provide holiday activities for young people in Oxford? Oxford City Council is joining forces with Thames Valley Police to hold a Have Your Say meeting in East Oxford. World-famous decorator Annie Sloan will help transform East Oxford Community Centre – and she needs residents to help! Hundreds of jobs and training opportunities will be available at a one-day job fair in Blackbird Leys on Wednesday 11 November 2015. Oxford residents aged 50 and over are invited to attend next week’s Old is the New Young festival. The next East Area Forum will take place on Wednesday 16 September 2015 between 6.30pm and 8.30pm at East Oxford Primary School in Union Street.